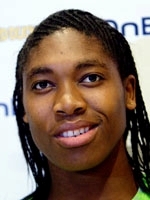 South Africa's Caster Semenya shot to international fame in 2009 dashing to 800m gold at the Berlin-hosted world championships in dominant fashion before her masculine appearance sparked an international debate, overshadowing her exploits on the track. Deprived of competition for eleven months by the IAAF as officials attempted to confirm her gender. The humiliated 21-year-old with a husky voice, masculine face and physique had her female gender confirmed and now goes to the London Olympics with the sympathy and support of the entire South African population. Her dominant win in Berlin, where she came out of nowhere to take the global crown at just 18 by crossing the line more than two seconds ahead of Kenyan star Janeth Jepkosge, should have been her finest hour. But instead it provoked an inquiry from the IAAF as to determine if she was really a female athlete. South African president Jacob Zuma described the persecution Semanya suffered as a "humiliation" and her compatriots who saw her as a symbol of hope for the poverty stricken after growing up under the care of her grandmother in dire conditions in Limpopo leapt to her defence as the row escalated. "She is my little girl, I brought her up and I have never doubted her femininity. She is a woman and I can repeat that a million times," defended her father while her grandmother admitted that she was often the target of mockery as a youngster and was the only girl in the local football team. "She never let poverty influence her life and she showed the world that when you want to win, nothing or anyone can stand in your way. She is a symbol of the success, power and strength that a woman can have". blasted Zuma who became the leading spokesman to represent the populations support of their "golden girl". "God accepted me as I am and I accept myself. I am who I am and I am proud of that", she said in the aftermath of her world title adding that she treated the controversy as some kind of bad joke. After a series of tests and investigations, she was finally cleared to compete again on July 6, 2010 following results provided by medical experts although she played down the ruling saying: "I forgot about it, it was so long ago but for me it is just a new start." Despite the extended lay-off, she came back to win silver behind Russia's Marya Savinova at the 2011 world championships at Daegu, South Korea to prove she had not lost her speed or ability. A massive amount of attention will be focussed on Semanya at the London Games in 2012 where her Olympic and world championship winning coach Maria Mutola of Mozambique hopes to see her win the ultimate prize in her sport and hopefully give her the respect and recognition she deserves as one of the finest middle distance runners in the world.